Oops. 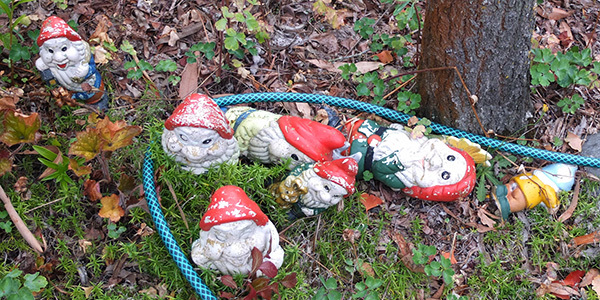 I'm lowering the tone of my house gardens by allowing a group of freshly painted Disney gnomes to take up residence. Their bright red hats are clearly visible from the house patio. 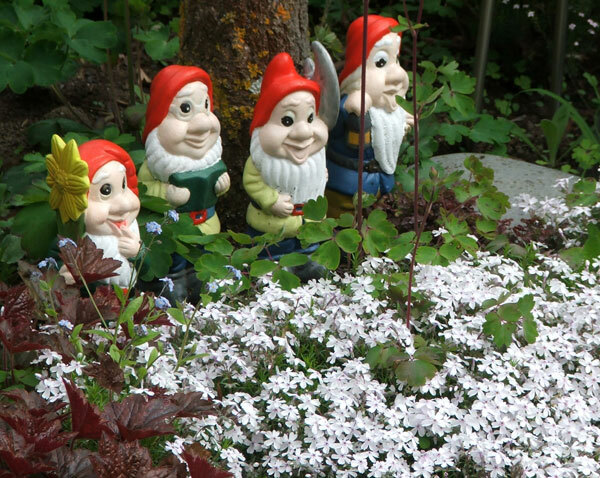 The gnomes are standing by purple Heuchera, a white carpeting phlox, and a small purple ground cover, a New Zealand Biddibiddi (AKA Acaena). They were rescued from a cardboard box at the back of a charity shop, in a complete jumble, their clothing in a dreadful state. I must admit I prefer the retro concrete chaps, but hey! I couldn't leave this lot behind. Garden Gnomes Mistaken for Red Tulips! I'm writing this in spring, when many groups of bright red tulips are flowering in the Moosey Garden borders. I don't often wear my spectacles in the garden, and when I spy the red hats of the gnomes I'm always taken by surprise - surely I didn't plant a batch of red tulips in there? Oh dear! Oh dear, dear me. Only a few short years later, attacked by that fierce garden hose monster - and nobody has helped them back to their feet. What a disgrace! What neglect!